Daily Glowing Shot Glasses Deals. Halloween Store. Incredible selection of Halloween Costumes, Halloween Decorations and more! 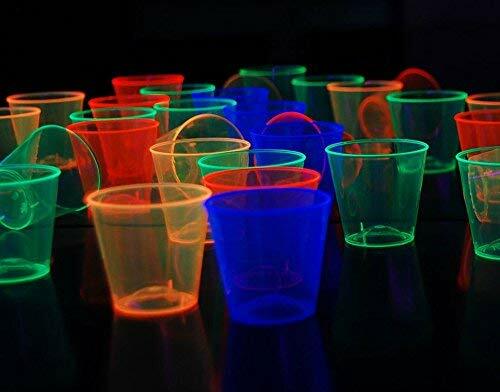 Assorted Color Glow Cups are awesome, UV reactive cups perfect for glow in the dark parties, outdoor get-togethers, cosmic bowling nights, and any other party your imagination can think up! Make it glow, we dare you. To activate, hold these Glow Cups under black light for a few hours and watch them glow in the dark all night long. Remember, the longer you let it charge in UV light, the longer the glow will last. Dimensions (W x H): 3.5" x 6" Volume: 1.5 oz. Includes 2 of each color: blue, yellow, pink, red, green, orange. NOTE: UV Reactive Glow Cups require blacklight to glow. Light Up Shot Glasses with Glowing LED Lights (Set of 24): Glowing Shot Glasses are fun lighted shooter glasses that come in a 24 pack of blue, green and red. Each light up shooter glass comes with drink safe sealed batteries and are made of acrylic plastic for easy washing. 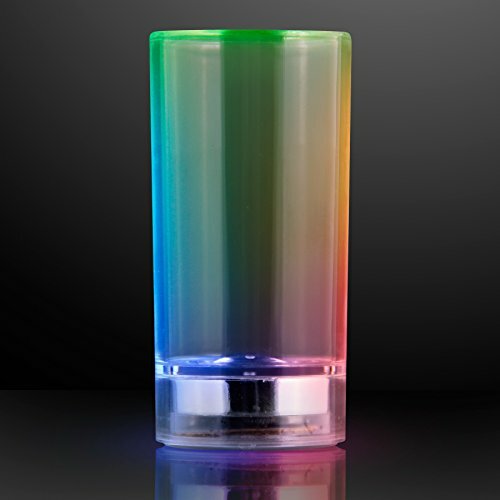 Every glowing shot glass has 3 light modes that include steady light, flashing and fast flashing modes. Instructions: Press the button at the base of the LED Shot Glass to activate and circulate through the 3 light settings. To wash the glowing shooter, simply hand wash using soapy warm water. Keep your shot glass handy wearing Light Up Pink Shot Glasses on Pink Party Beads! Give Pink Shot Glass Necklaces to your group on Ladies Night, use LED shot cups as party favors, wear your shot on Bourbon Street - you'll never lose it! To activate your Light Up Shot Glass, press the button underneath the mini cup. Choose from flash, blink and calm steady light. Dimensions: Shot Glass Width: 2.12 in. Shot Glass Height: 1.87 in. Volume: 2 oz filled to brim. Necklace Length: 31 in. Necklace Color: Pink. Cup and LED Color: Pink. Light Up Pink Shot Glasses on Pink Party Beads come ready to use, batteries not replaceable. 1oz capacity per glass. Perfect for your party! 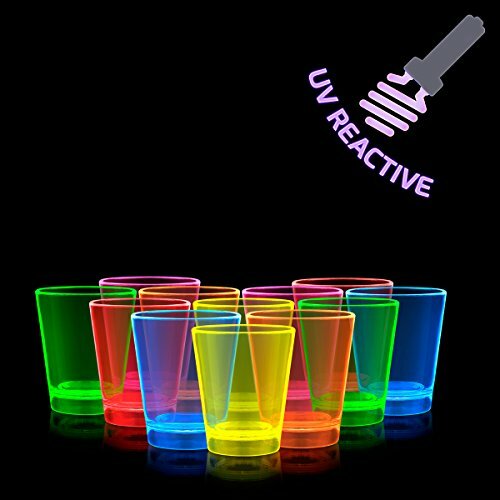 Liquid Activated Flashing LED Shot Glasses have a sleek design perfect for night clubs, bars and parties. 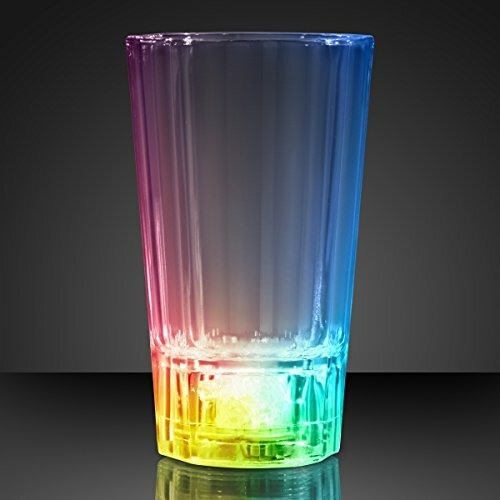 These tall, tapered Light Cups can be used for party shots of course, beverage taste testers, or send home with your guests as unique party favors! Flashing LED Shot Glasses are sure to spruce up any night time event. To activate your Light Up Shot Glass, simply fill with liquid. Two sensors at the bottom of the glass will activate two continuous flash funtions- first a slow color change rainbow, then a more rapid flash. Glasses turn off once empty and dry. NOTE: Never put lighted glasses in the dishwasher. Gently hand wash ONLY and keep moisture away from the base to avoid contact with batteries. "Glasses" are made of high quality acrylic that is FDA approved. Dimensions: Height 3.3 in. Width 2.0 in. Volume 2.2 oz. filled to brim. LED Colors: 1 Blue, 1 Jade, 1 Red. 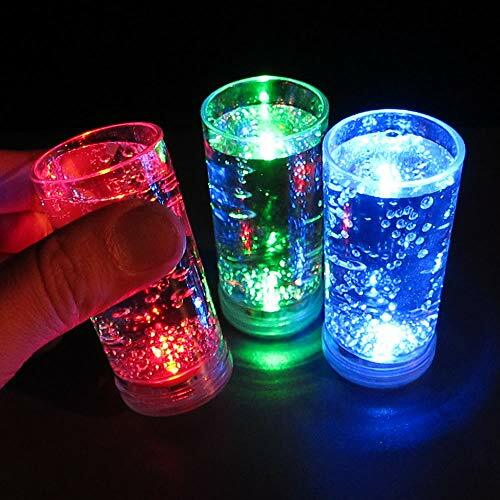 Liquid Activated Flashing LED Shot Glasses come ready to use with non-replaceable batteries. Keep your shot glass handy wearing a Light Up Red Shot Glass on Red Party Bead Necklace! 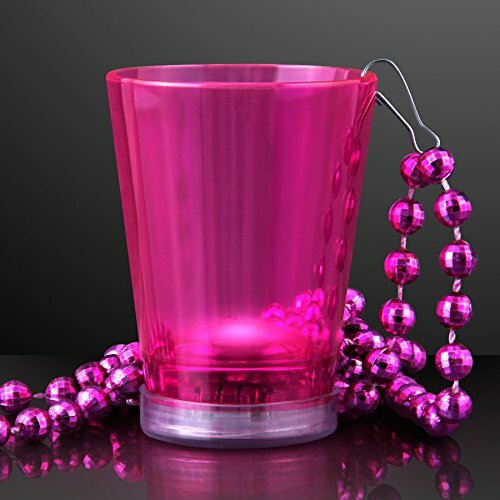 Give them out to your group, use as party favors, wear it on Bourbon Street - you'll never lose your party cup! Dimensions: Shot Glass Width: 2.12 in. Shot Glass Height: 1.87 in. Volume: 2 oz filled to brim. Necklace Length: 31 in. Necklace Color: Red. Glass and LED Color: Red. Red Shot Glass on Red Party Bead Necklaces come ready to use, batteries are not replaceable. Liquid Activated Light Up Shot Shooter Glasses have a sleek design perfect for night clubs, bars and parties. These small cylinder LED Cups can be used for party shots of course, beverage taste testers, or send home with your guests as unique party favors! Light Up Shot Shooter Glasses are sure to spruce up any night time event. To activate your Light Up Shot Glass, simply fill with liquid. Two sensors at the bottom of the glass will activate two continuous flash funtions: first a slow color change rainbow, then a more rapid flash. Glasses turn off once empty and dry. NOTE: Never put lighted glass in the dishwasher. Gently hand wash ONLY and keep moisture away from the base to avoid contact with batteries. "Glasses" are made of high quality acrylic that is FDA approved. Dimensions: Height 2.94 in. Width 1.48 in. Volume 1.6 oz. filled to brim. LED Colors: 1 Blue, 1 Jade, 1 Red. Liquid Activated Light Up Shot Shooter Glasses come ready to use with non-replaceable batteries. Glow in the Dark Shot Glasses Set 6-Piece- NIP! LIBBEY 6 GLOW IN THE DARK BARWARE SHOT GLASSES NEW IN BOX -NEAT!! !